It’s week 3 in the Support Driven Writing Challenge, and this week I’m posting about my thinking space. Let’s start out by establishing that I’m an introvert. I may be a bit of an extroverted introvert, but an introvert nonetheless. So naturally, being around people, or in social situations does not allow me to think easily. I’ll confess that the larger the group of people I’m around, the more taxing it is for me to sort through my thoughts. It’s like people are a mental jamming signal for me. Now, this excludes people that I’m very comfortable around. For example, a small group of friends can make sorting out my thoughts easier, as they know me, know how I think, and can assist in the sorting. For me, there are a couple of situations where thoughts get sorted out. I’ll start with the most…unconventional one: the shower. There’s something about a shower that allows me to sort out my thoughts better than any other space. And I guess that there’s a bit of proof that a shower certainly lends itself to that sort of thing. It’s in the shower that I’ve realized what I’ve been doing incorrectly when writing a script or program, had revelations about why some personal relationships work the way they do, and have come up with designs for some shave brushes. The second space for me to work things out is on the porch. A great example of this is the recent post/video I made of me playing around on the banjo. Porch time usually requires a good pipe, and some bourbon (Basil Hayden is my go to, if you’re wondering). There’s something magical about using music to work out my thoughts, and the pipe/bourbon certainly don’t hurt either. The last thinking space for me is at a good coffee shop, usually with a friend to talk things out. There’s something about having someone else to bounce ideas off of over a cup of coffee that I find refreshing. I remember that I used to do this weekly with my friend and mentor, Mike. 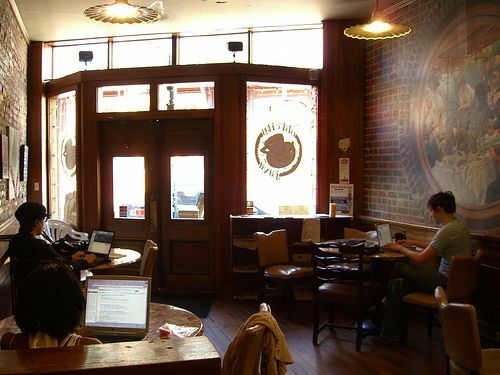 We’d meet every Tuesday at Old City Java in Knoxville, Tennessee for mentoring sessions. We’d also bounce ideas off of each other, and I found those times to be the most rewarding when I needed to sort things out, whether it be about family, work, or life in general. I do want to add an observation here–the importance of being disconnected. I’ve found that being constantly on a device seems to add to my mental pile of work. There’s also some research that lends some validity to this observation. Whenever I’m in any of those thinking spaces (and especially in the shower), I’ve found that it’s crucial to be disconnected…even if I don’t do a great job of disconnecting. I’ve also found that the lack of disconnecting and allowing myself to be bored is a major contributor to getting burnt out. If I’m letting that mental pile of work continue to grow, then I’m not doing anything to get out from under it. There’s also a bit of a rant here on being present, learning to switch off, and the value of actually engaging with real live humans here too, but I think I’ll save that for another post.